Recently an international team succeeded in verifying the isotope Iron-60 in deep-sea sediment. It came into existence in the fire-balls of exploding stars and made its way to the Earth millions of years ago. 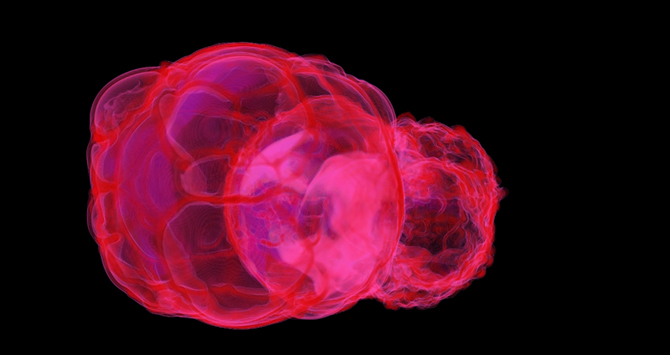 These supernovae were so close and so bright that our early ancestors were able to see them even during daylight hours. The isotope Iron-60 had travelled a great distance before it finally found its home on Earth. Its existence on earth is one of the few indicators for its cosmic origin, because this isotope is instable and is in constant decay; specifically, every 2.6 million years the previously-existing quantity is halved. If Iron-60 had been present during the formation of the Earth 4.6 billion years ago, it would have disintegrated entirely by now. If one is able to verify the existence of this isotope anywhere on the planet, then it would have arrived from outer space, according to prevailing astronomical standards, not so very long ago. There are no naturally-occurring terrestrial sources. Research scientists at the Technical University of Munich were actually able to trace minute quantities of Iron-60 in the manganese crust of the South Pacific in the years 1999 and 2004. These deep-sea deposits are rich in iron and increase very slowly at the rate of only a few millimetres every one-million years. This leads to the material being considerably compressed, and rare substances such as iron-60 are concentrated in small volumes. Iron-60 must have originated from supernova explosions, in reference to which research scientists know that they hurl huge quantities of the isotope out into space. At the end of their lives, massive stars produce many new elements - among them the long-lasting, radioactive iron isotope. If a supernova explosion takes place near the Earth - although "near" in the cosmic standard implies a few hundred light years - it can still reach us. Researchers also wanted to know when exactly the explosions occurred. In this regard, the slow growth of the crusts proves to be a disadvantage: Because the layers of sediment are so thin, the level of disintegration over time is quite low. With new samples and technologically refined apparatus, a team of research scientists from the Helmholtz Zentrum Dresden-Rossendorf (HZDR) made a crucial contribution by pursuing the gripping issue of whether the time span of the supernova could be determined. "Data collected from the manganese crust in 2004 show us in which time span we have to search in other samples," explains Jenny Feige, who wrote her doctoral thesis on this topic at the University of Vienna. "Specifically, we are able to obtain highly precise data from deep-sea drill cores that grow a few millimetres over a mere thousand years of development." The trick in this regard was just to substantiate a few Iron-60 atoms inside multi-metre bore cores taken from the Indian Ocean. First of all, about one-hundred samples had to be chemically processed. This took place under the leadership of Silke Merchel from HZDR, who made use of a particularly gentle procedure in this regard. It was possible thereby to dissolve and extract the decisive elements for the analysis. In addition to Iron-60, the research scientists were also interested in the isotopes Aluminium-26 and Beryllium-10, the relative frequencies of which could be used to determine the age of the sediment layers. These samples were then analysed in accelerator mass-spectrometers. These machines, only a few of which exist throughout the world, count individual atoms in dependence on their mass. The team made use of a facility at the Australian National University in Canberra as well as the European facility VERA in Vienna and DREAMS at the HZDR. Jenny Feige prepared the samples and analysed them at the HZDR over a time span of 6 months. The result: from all of the samples it was possible to confirm only 538 Iron-60 atoms. From this one can deduce that during that period of time throughout millions of years, only a few kilograms of Iron-60 made it to the Earth. But these few particles were in a class of their own: "Surprisingly, we found not only one peak in the sediment samples within a time span of 1.7 to 3.2 million years ago; there was a second one, taken from new manganese crust samples, in a manganese crust dating from 6.5 to 8.7 million years ago," says Jenny Feige. The temporal breadth was also amazing; it indicates that not only one supernova left its tracks behind, as hitherto assumed - it was rather two or three. A team of experts led by Dieter Breitschwerdt and Jenny Feige from the TU Berlin suspects that the origin is to be found in the so-called 'local bubble'. That is an area of space measuring around 600 light years in diameter that is filled with a thin, hot gas, in which our solar system is also located. With the aid of computer models, they were able to explain the emergence of this bubble. This revealed that, initially, approximately 16 supernovae exploded one after the other in a young star cluster. The surviving members of this cluster can still be observed today in the constellations Scorpion and Centaurus. The explosion clouds then spread out and unified into the local bubble we see today. The Iron-60 that emerged from the explosions settled on dust particles that were also spread out at high speed through space. After about one-hundred thousand years the Iron-60 from the last two or three supernovae made its way to the Earth's atmosphere, falling to the ground and into the oceans. At that time the supernovae were about 300 light years away. Thus the ultraviolet radiation and X-rays released at that time were probably not dangerous to the biosphere. Experts anticipate considerable damage at distances of 30 light years or less. Nevertheless, Adrian Melott from the University of Kansas, USA, in an annotating study points out that 2.6 million years ago the global temperatures were sinking and transitioned into a series of glacial periods in the Pleistocene. A causal correlation with the supernovae is however not verifiable. In addition to the fascinating astronomical findings, the study is also remarkable in other respects: It is an example of highly successful interdisciplinary and international collaboration. "Chemists, geologists, physicists and astrophysicists had to work together on the topic in order to come to this fascinating result," concludes Georg Rugel from HZDR.